Look, the Giants for most of my adult life have been great at utilizing short passes to their backs and receivers — but in the past few years since Tiki Barber has departed, the strategy of dumping off to the backs on a regular basis seems to have departed as well. Admittedly, my problem with the lack receptions to the backs is only a problem when the team fails to produce a spark on offense, or there is clearly missed opportunities to turn a negative yardage sack into a positive yardage situation, first down, or even touchdown. Last Sunday when the Giants dropped a very winnable game to the Chargers — I couldn’t help but think about the missed opportunities as I watched Eli get dropped for 5 sacks seemingly helpless to get rid of the ball. But as I watched Jacobs and Bradshaw work their way free after the snap, I kept thinking to myself — is it really so hard to turn and drop it off to your running back in the open field and ask that he make a play? I know I know, Bradshaw did have 3 receptions for 27 yards — but there were far more opportunities for Eli under duress to kick it out to his running back who was freed up. Missed opportunities. San Diego by contrast utilized the type of play I’m talking about and modestly turned a short pass to Darren Sproles into a 21 yard daggar. The gash created in the Giants Defense led to the game winning touchdown pass, quite possibly because the Giants were still reeling from the short to mid range jab that had just caught them on the chin. Unpredictability and creating these kinds of hard to defend against opportunities go a long way in the NFL. We saw all camp and preseason how the Giants wanted to come out passing, utilizing their backs as receivers much like the Eagles, Chargers, and well — like the Giants used to do. Yes, I realize this seems redundant. But don’t you remember the days when Tiki would routinely run for 150 yards with a touchdown, and then record another 100 yards receiving and another touchdown? Why has the usage of this offensive ammunition all but vanished from the Giants arsenal? Because we no longer have the weapon perhaps? 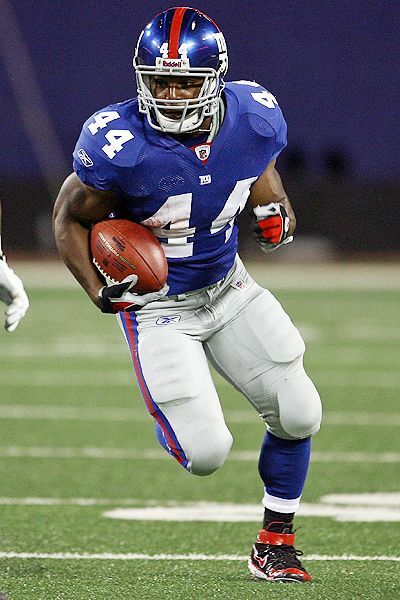 This takes me to the point I tried to make earlier in the week in Unpacking the Loss… Ahmad Bradshaw is a dangerous weapon that seems to be getting the wrong kind of touches. He’s explosive when he gets outside, and the more the Giants design and call plays for him that allow him to get into the open field where he can cut back, break out, and break through the teams secondary — the better. Q: When a guy averages six yards a carry, you are okay with 11 rushes for him? A: Well, I would hope it would be 15 with six yards a carry. But we are going to continue to utilize all of the backs as best we can. Funny, you guys weren’t talking about this a couple of weeks ago when you didn’t think he was playing that well. Q: He seems to be running more effectively the last several weeks? Notice anything strange about this comment? It would seem that the Giants were making decisions on the running rotation based on what had occurred a few weeks ago in a completely different game, in a completely different set of circumstances, against a completely different team, yadda yadda yadda. You know what — while this is frustrating for me and every other Giants fan that watches each game with a pulse… it’s not surprising. Because the Giants are largely INCAPABLE OF MAKING ADJUSTMENTS MID GAME. Game plan till we die, that’s the Giants way. The only exception to this rule was Spags — whose defense would consistently come out in the second half and completely eliminate the oppositions strengths from the first half. Inspiring football at its best. Marion Barber for example ended up with 120 first half yards and a touchdown in the 2007 playoffs. You know what his second half stats were? 9 yards. THAT is mid game adjustment at it’s best — and the results were obvious and powerful. So back to Sunday and what I believe is a major problem in the back rotation — Bradshaw got the runs up the gut that Jacobs should have, while Jacobs and Hedgecock caught passes that Bradshaw should have gotten. Needless to say of course, there should have been more reps for each. Jacobs was fired up and should have gotten more like 20 carries. Bradshaw could have easily been utilized on 3 of those sacks on Manning with a quick chuck to the outside where Ahmad was being freed up to an open field. Hindsight — whatever. If you must, make that safety valve play an integral part of the offense like we were seeing in camp and preseason — filling that need has not disappeared in the last 9 weeks, it’s only been strengthened. So enough with the decisions based on 3 games ago coach. LIVE IN THE NOW!!! The potential for Bradshaw to be the next Tiki Barber is apparent. The stats along indicate that every time Bradshaw catches a ball he’s flirting with the first down marker. Should he or should he not have more than 16 catches in his 3rd year? Let me know your thoughts. But it’s clearly time for the coaching staff of the Giants recognize how Bradshaw can best be utilized, and become the most dangerous team in the NFL at every level that they are capable of being. You don’t even have to emulate other teams to get there — all you have to do, Giants, is remember who you are and what your strengths are. Power smashmouth football via a ruthless pressure defense, relentless running, and well designed short passes. Play to your strengths this second half of the season, I guarantee a renewed focus on getting your best players the ball in the ways that they are best utilized will result in a marked improvement. And to completely spell it out, that means WINS. I couldn’t agree with you more. During the Sims/ Parcels era the Giants had a third down back specialist whose name I don’t recall. Sims would drop back to pass and while looking downfield put the ball in his gut. The back would take off and almost always pick up major yardage. That would be a great play for Bradshaw.